It is a two-stage design in a Phase III setting which was proposed by Liu et al. (2010) to adaptively modify accrual in order to broaden the targeted patient population. Adaptations: Change in the inclusion criteria of the study population after the initial stage of the study in order to broaden the targeted patient population. At the interim analysis stage, the treatment effect of a sample of patients (n1) from the biomarker-positive subset is estimated. If an improvement is seen in the experimental treatment arm which is greater than a pre-specified threshold value (i.e. the estimated treatment difference between the novel treatment arm and the control treatment arm for this subpopulation is greater than a threshold value c divided by the square root of the aforementioned sample size n1) the trial continues with accrual of patients from the entire biomarker-positive subgroup and additional patients are also accrued from the biomarker-negative subpopulation; otherwise the trial is stopped for futility. At the end of the trial, the treatment effect is estimated for all subpopulations. Researchers should choose the sample size n1 so that a persuasive result can be reached when the first stage of the trial is completed. In general, the threshold value c can be determined so that is a proportion of the smallest meaningful treatment improvement that researchers expect, e.g. it can be set to half of the smallest clinically important difference. Other methods also have been proposed. Note: Liu et al. 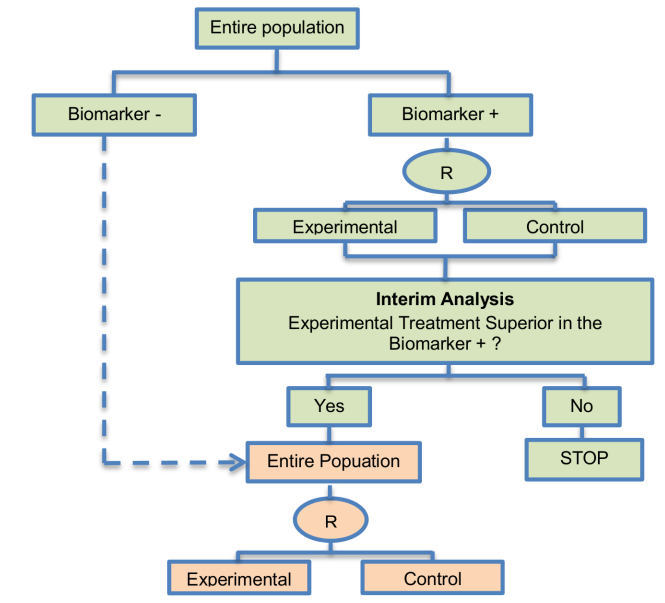 (2010) give a detailed description regarding the statistical formalization of the Type I error rate of this two-stage test and the power for assessing group-specific treatment effects. Also, Liu et al. (2010) give detailed information on testing hypotheses based on the overall treatment effect indexed as a weighted average of the group-specific treatment effects, where the 'C/(root of n1)' weight can be specified as the prevalence of that particular subgroup. More cost-effective as it avoids further recruitment of patients when there is no difference in treatment outcome among the biomarker-defined subgroups. Researchers can use the data which was accumulated during the first stage of the study to proceed with further investigation of any other potential assumption made at the start of the trial. Cannot work if there is no information about a subset of patients for whom the novel treatment is more effective than others before the beginning of the trial.